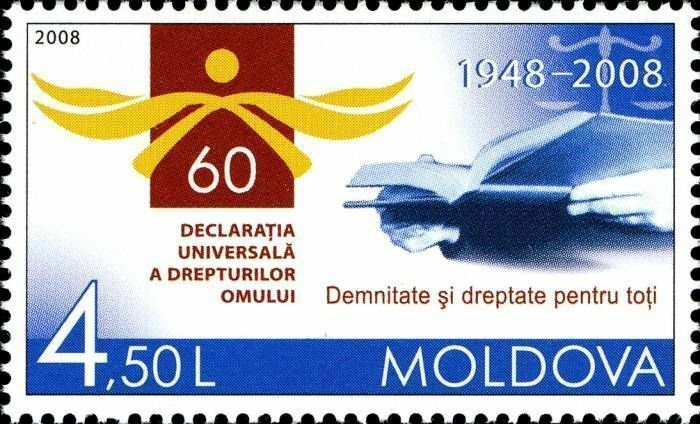 On 10 December 2008, the Post Office of Moldova (Poșta Moldovei) issued a postage stamp with the title 60th Anniversary of the Universal Declaration of Human Rights. The issue comprises one stamp, with an associated cancellation (postmark) and first day cover (FDC). The designer was Vitaliu Pogolşa. The printing was performed by Tipografia Centrală, Chişinău. The Universal Declaration of Human Rights (UDHR) is a declaration adopted by the United Nations General Assembly on 10 December 1948 at the Palais de Chaillot, Paris. The Declaration arose directly from the experience of the Second World War and represents the first global expression of rights to which all human beings are inherently entitled. The full text is published by the United Nations on its website. Read more.. This article uses material from the Wikipedia article 'Universal_Declaration_of_Human_Rights', which is released under the Creative Commons Attribution-Share-Alike License 3.0.